A while ago I bought the WT2 tester (Smith & Larson Audio) and I’ve started to explore its features and capabilities. I’ve used the WT3 tester (Dayton Audio) for a long time and after some discussion threads at diyAudio regarding the WT3 vs. WT2 capabilities I became interested in exploring and comparing the two. Let me first point out that the WT2 and WT3 tester are different products. The WT3 tester isn’t a newer version of the WT2 tester, even if the name might give the impression of it. Both testers are supplied with software, USB cable, measurement cable and a calibration resistor. 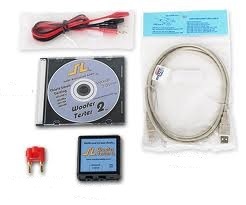 The WT2 tester uses a 10 Ohm 1% tolerance resistor and the WT3 uses a 1k Ohm 1% tolerance resistor. Note! I personally use a higher tolerance 10 Ohm 0.1% calibration resistor for all my measurements. The WT3 tester has never caused any real issues or problems for me. It has been reliable, fast and easy to use. Some people have raised doubts that the WT3 tester doesn’t produce correct Q values in T/S measurements. This is partly true, but based on the impedance plot produced by the WT3 tester the Q values are correctly calculated. The question is however, can the impedance plot be of higher resolution and detail in order to get a more accurate Q value calculation? The answer is yes. The WT2 tester does seem to have a better algorithm and accuracy in measuring the resonance frequency at low frequencies. Besides that the WT2 tester has a lot more features than the WT3 tester (I haven’t tested all yet), but it also has a higher price tag. I think the higher price tag is fair given its more extensive features. Partly due to its simpler functions the WT3 tester is easier and more intuitive to use and compared to the WT2 tester the user interface is more clean and robust to use. The WT2 user interface feels a bit outdated and is more cumbersome to use. The window handling doesn’t feel so consistent in its behavior. This shouldn’t be read as criticism on the WT2 capabilities, rather as suggestions of hints to future improvements. I haven’t yet tested and used all of the WT2 capabilities, but I have done some T/S parameter and impedance measurements to compare with similar tests on the WT3 tester. I’ve used a pair of high quality SB Accoustics Satori MW16P-4 mid-woofers and ScanSpeak Illuminator R3004/602010 tweeters with a high driver consistency for the measurement tests. The “Delta mass” method is used for T/S parameters measurements and the Impedance plots are made with 344 measurement points for both the WT2 and WT3 tester. 344 measurement points is the setting the WT3 tester has and it cannot be changed. The frequency range is 1-20000Hz. All drivers are measured “cold” without any e.g. suspension “massage” The WT2 and WT3 tester is calibrated with the same 10 Ohm precision (0.1%) calibration resistor. The results are exported in the “zma” format and imported in to the WT3 tester for visual comparison. The pictures show the Satori MW16P-4 mid-woofer. We have some variation in the lower frequencies and above 10kHz, but between 100Hz and 10kHz the impedance plot is almost identical. The pictures show the ScanSpeak R3004/602010 tweeter. 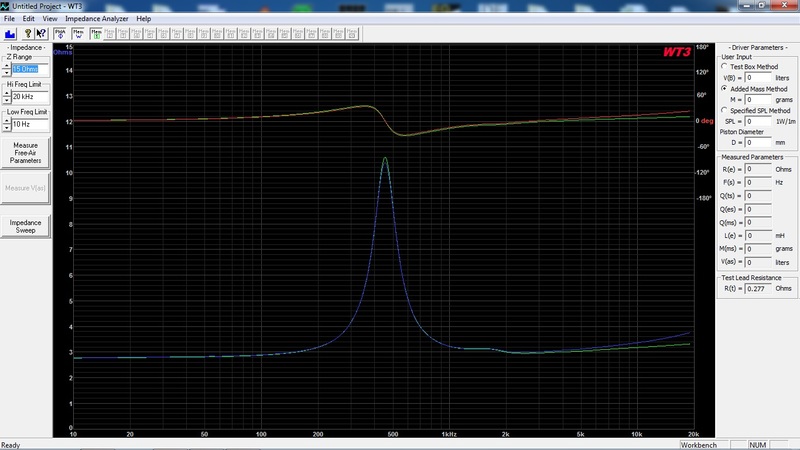 The impedance around the resonance frequency is virtually identical. At higher frequencies starting at >5kHz we have some variation even though not a huge difference (about 0.18 Ohm @ 10kHz). Here the WT2 tester gives a result which appears to be closer to the manufacturer’s specification. 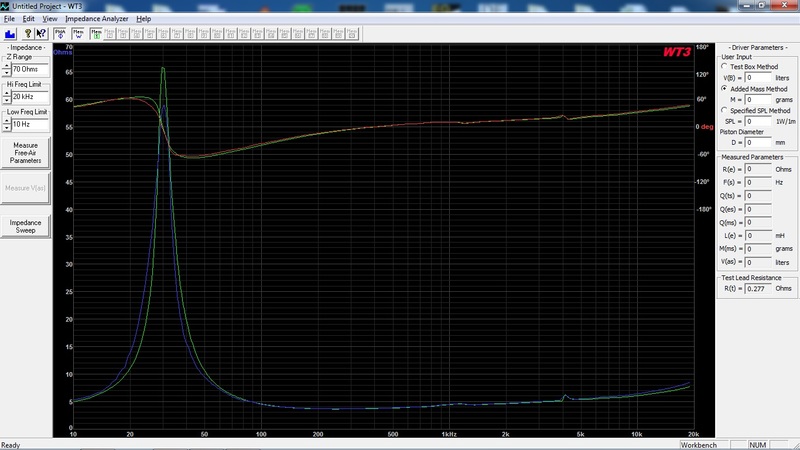 The picture shows the T/S parameters for the Satori mid-woofer. Not surprisingly, we have some variations here as well. The differences aren’t huge, but the WT3 tester seems to consequently give a bit higher Qts values. This is confirmed by test measurements I’ve done on other random drivers I have. Here I think the WT2 tester measurement method and its more detailed measurement resolution contributes to a more accurate result. The picture shows the T/S parameters for the ScanSpeak. Here at higher resonance frequencies the variations are negligible. The resonance frequency is within 0,13% and the Re is within 1.5% between the WT2 and WT3 tester. 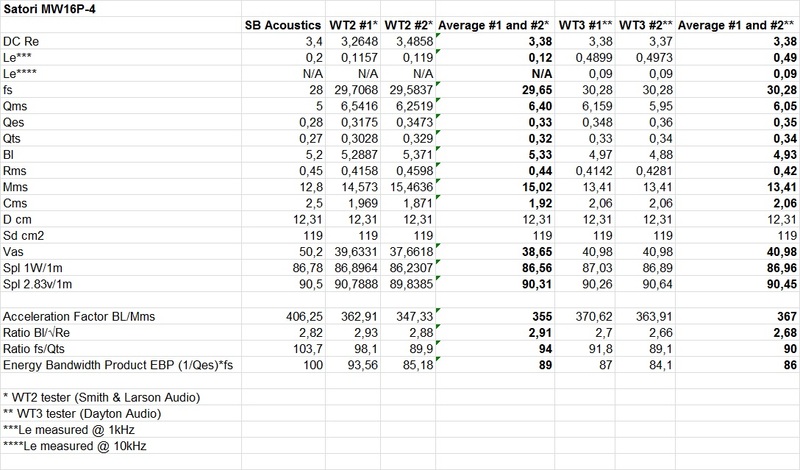 The picture shows the differences in a text book QB3 box alignment calculated from LspCad Pro based on T/S parameters from SB Acoustics specification, WT2 tester and the WT3 tester. Here we obviously can see some differences due to the different box volumes and port tunings. The picture shows the results using an enclosure with a volume of 19 liters, a port tuning of 38Hz and an added simulated filter coil resistance of 0.3 Ohm (Rg) based on T/S parameters from SB Acoustics specification, WT2 tester and the WT3 tester. Ok, here we can see virtually the same response whether we used the manufacturer specification, the WT2 or the WT3 tester calculated T/S parameters. The WT2 tester does seem to be a bit more accurate in its T/S parameter and impedance measurements as well as featuring more functions than the WT3 tester. 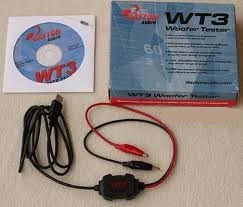 The WT3 tester however is simpler and faster to use and has a lower price tag than the WT2 tester. As a comparison the WT3 tester does an impedance sweep in about 1.5 seconds. The WT2 tester takes about 8 minutes for the same impedance measurements setup (WT2 uses a Sine wave signal). In real life, does it matter which one to choose for an accurate box design calculation or cross-over filter design? In my opinion no not really, but if you want perfection for the T/S parameter calculation and the added features, go for the WT2 tester. If you don’t find the T/S parameter accuracy and the added features of the WT2 are the most important and prefers fast and simple measurements almost equally good for cross-over design, go for the WT3 tester. I personally think both the WT2 and WT3 tester are nice tools and I will in the future use both where it’s applicable. In the next loudspeaker project I will use both tools and compare if the impedance plots have any impact on the final design results. Read full article |Comments Off on Measurement Tools!